The cherubic director resting on one of his set's spun-glass clouds. Set entirely in one location—a Manhattan penthouse—Rope takes place in real time, about 80 minutes. Two young men, gay lovers Brandon (John Dall) and Phillip (Farley Granger), want to test the Nietzschean concept of a "Superman" who, by virtue of his superior intellect, can take life. Envisioning a murder as perfect as a work of art they strangle a Harvard undergraduate and, for an artistic flourish, they hide the body in a chest. Finally, like a painter signing his finished work, they celebrate their "masterpiece" by throwing a dinner party to which they invite friends and relatives of the victim, serving the meal from the very coffin in which their victim lies. That such macabre touches don't veer into low camp is reason enough to defend Hitchcock's brilliance. The film's setting—a dinner party—is the perfect venue for exploring the nature of power: such social events are a veritable Petrie dish for the study of social power structures. None of this would have been news to Brandon, who had earned a reputation for staging the finest, most tastefully executed soirees. That's what made his dinner party in Rope so odd. The warped logic of the guest list (such as the forced reuniting of two recently broken-up lovers), the abrupt switch to an informal buffet style (instead of the formal dinner the guests were expecting), and the unappetizing conversation topics (discussion of murder and chicken mutilation - while dining on roast chicken, no less) added up to a surreally weird evening. Not surprisingly, the party was cut short, ending in tears and confusion. By any mark, the event was a disaster. But Brandon declared it "a success". Echoing Hitchcock himself, he said it was "the most exciting party [he had] ever given." The power plays engineered by Brandon went beyond his and Phillip's murder of one of their guests. From the film's beginning, Phillip is so regretful and panicky, one wonders, "How did he get involved with this scheme in the first place?" Apparently, his partner coerced him. And then he ended up doing all the dirty work. For instance, Phillip did the actual strangling, while Brandon merely stood by and helped. Throughout the evening, Brandon bullies, cajoles and manipulates Phillip into doing his bidding - even as Phillip's drinking makes him increasingly uncontrollable. Finally, Phillip rats Brandon out, confessing to the murder. Brandon's bid for superiority extends to his mistreatment of Phillip, and one gets the impression that Brandon confers "elite" status on his partner only as long as he remains under Brandon's control. Women are clearly at the bottom of the power structure in this story. Phillip, who avoids eye contact with any of his female guests, takes special pleasure in humiliating the housekeeper, Mrs. Winter. "I expect you to serve my guests—not lecture them!" he scolds. Later, Brandon insults the elderly Mrs. Atwater. "I read many books when I was younger," she says. "We all did strange things in our childhood," he replies. Phillip remains aloof from his female guests and dismisses Brandon's maneuvering of Janet back to her lover as a silly game. However, all of the women are helpless to extricate themselves from the pair's abuse of their host privilege. And so Mrs. Atwater has no rebuttal for Brandon's insult, Janet is unable to resist being coerced back into Kenneth's arms, and Mrs. Wilson must put up with Phillip's attitudes with the pursed lip of a domestic servant. From this moment on, it is Cadell who watches over the goings on with a cool, detached eye; who chooses the persons with whom he will talk; and who subtly undermines Brandon's authority to control the atmosphere in the room. Ultimately, Rope's power arc punches right through the film itself into the behind-the-scenes reality that led to the making of the film. While he was an employee of David O. Selznick, Hitchcock chafed under that producer's obsessive creative control. After fulfilling that contract, he formed Transatlantic Pictures — a partnership between Sydney Bernstein and Hitchcock — in which Hitchcock was both director and producer, making him one of the first major directors to assert total creative control in that way. Hitchcock was determined to never again endure conflicts — and compromises — with overbearing producers, and Transatlantic was supposed to give him that freedom and power. I believe that Rope was his personal statement of emancipation. The audience is never left in the dark as to who the real controlling force behind the dinner party is. From its opening credits, Hitchcock's pervasive control is felt. The titles scroll up over a vacant Manhattan street, until they freeze on: Directed by Alfred Hitchcock. At that moment, as if cued by the director (which, of course, as what happened), the street comes to life with foot and auto traffic. The director intervenes at times to thwart his characters' attempts to assert their own self-determination.8 For example, after disparaging weakness as being merely ordinary, Brandon brashly declares "I won't let either of us stoop to—" and then the front door buzzer goes off, cutting Brandon off in mid-sentence. Moments later, Mrs. Wilson says, "Believe me, the next time we throw a party, I'm going to—" and is curtly interrupted by Phillip's Hitchcockian, "Good evening, Mrs. Wilson." The characters (or the actors who play them) will do exactly what they are told; they can check their self will at the door.9 The timing and nature of these cues points to an off screen force: "Directed by Alfred Hitchcock". That conclusion is unavoidable when you consider various story elements that take us out of the film and into the real world of Hitchcock. For instance, when Janet and Mrs. Atwater mention the "divine" and "heavenly" performances of a movie they had recently seen starring Cary Grant and Ingrid Bergman they are obviously referring to Hitchcock's "Notorious", made two years' previously. 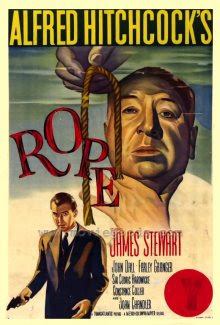 As a result of these tricks and treats, Rope is uncannily unlike like any other movie I've ever seen: I may be watching James Stewart and company, but I'm almost constantly thinking of Alfred Hitchcock. As writer Susan Smith points out, during the Grant/Bergman exchange, Hitchcock is as invisibly present as David Kentley's corpse hidden in the chest. Hence, David and Hitchcock are simultaneously "there-but-not-there", as "bodies necessarily effaced them from the characters' sight, but whose presence the humor is doing its utmost to make more tangible for us." A promotional still, with Hitch in the chest off of which dinner was served. In the film, the murder victim lay there. Phillip (Farley Granger) Brandon (John Dall) and Rupert (James Stewart) look on. Hitchcock's cameos also serve the same function. They take us out of the movie, if only for a moment. That's why his walk-ons generally occur early in the movie, so as not to distract from the drama of a later, more important scene. In fact, his cameo in this movie is the most striking piece of evidence that Hitchcock was an actual character in the movie — and its most powerful. For a full explanation, check back in with this blog. 1 As told to Favius Friedman in Popular Photography, November 1948. "My Most Exciting Picture". 2 The location for the story moved as it was treated by various artists. The true story (see footnote below) occurred in Chicago. Patrick Hamilton wrote a play based on these events called "Rope's End", but moved the students to Britain's Oxford University. 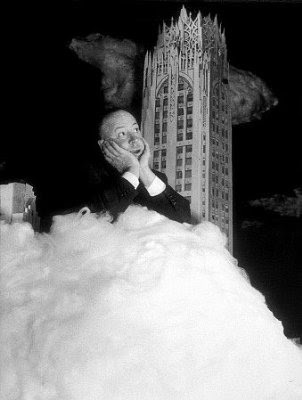 When Hitchcock optioned the play, he transferred the story to New York City, which required numerous subtle changes to the script and, as noted, considerable investment in an accurate replica of the city. This suggests that the director had many reasons for making such a move, one of which must surely have been that he wanted to place the killers in a city that was as gargantuan as their own egos. Although Hitchcock's victim is a Harvard undergraduate, it isn't stated explicitly where Brandon and Phillip went to college. My guess is that they were Yalies. 3 This story is based on the famous true-life "Leopold and Loeb" case of 1924. In what was then dubbed "The Crime of the Century", two University of Chicago students kidnapped and murdered a fellow student in order to style themselves Nietzschean "Supermen". The duo was represented by anti-capital punishment activist Clarence Darrow, who stated in his concluding remarks: "this terrible crime was inherent in his organism, … Is any blame attached because somebody took Nietzsche's philosophy seriously and fashioned his life upon it? … It is hardly fair to hang a 19–year–old boy for the philosophy that was taught him at the university." Darrow, therefore, broadened guilt for their crime to include the community which fostered their thinking. That theme of shared, or community, guilt is a predominate subject of Hitchcock's films. 4 "The Rituals of Dinner", Grove Weidenfield 1991, pp. 91, 95, 96, 100. 5 Of the eight or ten pictures that line the pair's walls, nearly all of them depict lone women. One exception is the large, haunting pastel or chalk rendering of a group of wraithlike women with blackened eyes. It is a picture of bereavement en masse. 6 FYI, "veuve" is French for "widow". Hitchcock, an oenophile who spoke semi-fluent French, would have known that. He also made a point of making sure the label champagne bottle's label could be read onscreen -- an unusual occurrence, when you think about it. 7 James Stewart's star power also upset Brandon and Phillip's hierarchy. Prior to his arrival, the two somewhat well-known actors occupied center stage. But when megastar Stewart entered as Rupert Cadell, he stole the show. Cadell arrives at the apartment unannounced. Like Mrs. Danvers in "Rebecca" he simply appears in the room. Everyone- - including the audience -- is taken by surprise by his quiet arrival. I believe that the framing of his first appearance alludes to Hitchcock's cameos. Like most of the director's cameos – and unlike most star appearances in a movie - we need to pick out Stewart in a wide angle shot. I still get a frisson of recognition when I spot him in the crowd - a feeling similar to spotting the director's walk-on. This, I think, is precisely the point. Like many Hitchcock protagonists - and villains! - Cadell stands in for Hitchcock. Cadell's macabre sense of humor, his intellectual agility, his authority - and his entrance into the movie - speaks to that. 8 See also Pirandello's "Six Characters in Search of an Author." 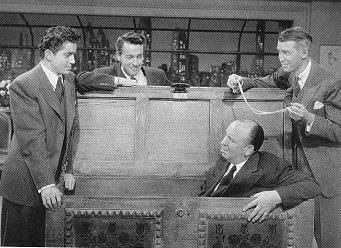 9 The rope, which comes to mean many things throughout the course of the movie - murder weapon, phallic symbol, hangman's noose - also suggests the very short leash on which Hitchcock kept his actors. 10 "Alfred Hitchcock: Humor, Suspense and Tone", British Film Institute 2001, page 71. Ironically, this essay is very unfunny. But Smith makes up for that with her great insights and a refreshingly non-jargony style. One of my responses to Rope is the feeling of my being manipulated. Yes, I know things the characters don't, but it is still so clearly a Hitchcock driven piece from start to finish (as you say) that it feels like I don't have any choices about my response to the movie. I think the zoom-ins during film canister changes add to this feeling. I'm interested to see where else you are going with this.